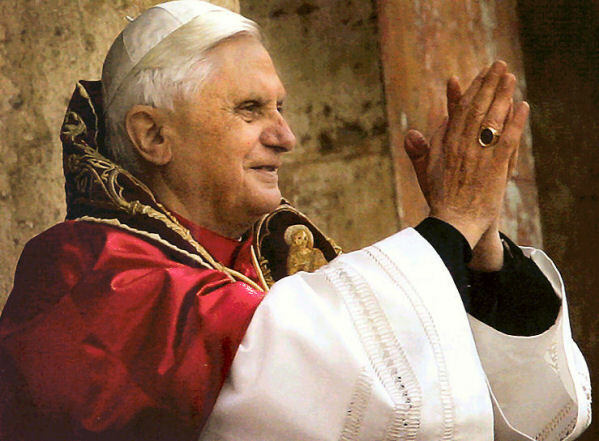 LORENZAGO DI CADORE, Italy – Pope Benedict XVI has reasserted the universal primacy of the Roman Catholic Church, approving a document released Tuesday that says Orthodox churches were defective and that other Christian denominations were not true churches. Benedict approved a document from his old offices at the Congregation for the Doctrine of the Faith that restates church teaching on relations with other Christians. It was the second time in a week the pope has corrected what he says are erroneous interpretations of the Second Vatican Council, the 1962-65 meetings that modernized the church. It is interesting that this is similar to the language the LDS Church uses. Strangely this does not offend me in the slightest. I have had many people justify their staunchly anti-Mormon rhetoric based solely on the account of the first vision that says that the creeds of other Christian Churches are an abomination. When press for examples of where the LDS Church has “persecuted” them, they fail to produce anything other than this account. The statement by Pope Benedict XVI is basically a euphemism of the first vision condemnation of other Christian creeds. I can’t be offended because Catholics have the right to believe what they want. It doesn’t offend me that they say my particular religion is not true. Does what the Pope said offend any LDS or non-LDS Christians out there? If so why? Hearing the Catholic Church dictate this does not bother me in the least, but for some reason, hearing members talk about the Catholic church being the GAAC angers me. Maybe because my mother is Catholic and I know what a good person she is. I think the problem with Christian sects regarding the LDS church is much more than the statement in JSH. Missionaries tell ALL investigators this as part of the teaching process. This is viewed as LDS actively teaching others that their church is not true. So for LDS to say that they do not preach anti-faith dogma is 100% incorrect. They are just more tactful about it, but they do it nonetheless, and ALL LDS do it, not just radicals. That kind of talk irritates me also (although when I hear this it is mostly in a private setting where someone is expressing their [Bruce R. McConkie’s] feelings and not what they were taught in Church). It really doesn’t matter what religion it is though, if someone talks bad about someone else’s faith in church or out I always get uncomfortable and want to change the subject. I really don’t think it is appropriate to ever belittle or mock someone because of what they believe. You are right to say that the LDS Church teaches that other religions or churches are not true (just like the Pope just pronounced), but Mormons don’t go to their events holding up offensive signs and yelling verses out of the Book of Mormon at them using a megaphone. Nor do LDS congregation have entire classes or sermons dedicated to “teaching” people the (pick a denomination) is wrong. In short, it is one thing to disagree with someone’s theology, but it is another to pound yours into their head when they aren’t asking for it. I think the reason why the people I’ve talked to like to bring up the first vision account is because it is the one instance they can point to that uses such harsh language. Words like abomination and phrases like their heart are far from me can leave someone feeling like they are attacked. Especially when they know that the people they go to church with are really good people. The LDS church is definitely more tactful in their approach, and don’t teach entire classes unless you count the Gospel Fundamentals class taught to new and reactivated members. But one could say that missionaries try to teach doctrine that was not asked for as well, yet as you put, not in a demeaning way. The first vision account IS the only thing taught by the mormon church, but it is pushed pretty hard so it is front and center and gets A LOT of visibilty. I have heard responses from non-LDS christians and some of them are upset by the comments. What gets me is that I see a hypocrisy by some Christians that get deeply offended by the catholic church telling them they are not true Christians, yet these are the same people telling Mormons that they are not Christians. If anything, I think it puts things in perspective. I don’t believe in the church anymore, but I also don’t like it when people say that Mormons aren’t “Christian”, just because they have a different belief system. I feel that people have a right to believe what they want as long as it isn’t harming anyone and people also have a right to call themselves Christian without their belief being questioned by other groups. The book of Mormon was written by a convicted charlatan who wrote it while looking at a seer’s stone in the bottom of a hat. Joseph Smith, Jr. is a false prophet and the Mormon Church and the Masonic Temples are the Church of Satan. In any discussion with a Mormon about Mormonism’s conflicting teachings on the nature of God, you have to cut away the camouflage. You have to get to the central facts. It’s simple, really. Just show them how the Book of Mormon conflicts with Smith’s later teachings. If he was right about God, when was he right? Take your pick, but you can’t pick both, and neither can a Mormon, except if he uses doublethink. If a Mormon chooses either teaching as correct and admits the other must be wrong, Smith’s credibility as a prophet collapses. Truly absurd! I feel so sorry for so many “true” believing Mormons ~ so many have been deceived by the false prophet Joseph Smith, Jr.
Not sure you can say that Joseph was a convicted charlatan (please provide proof). I know he was accused of several things, but to my knowledge he was never convicted. I also fail to see how the Mormon Church is anymore Satanic than any other Christian denomination or sect (which means I don’t believe it is Satanic). You are certainly allowed your opinion and I know several people that would probably agree with you, but just throwing accusations out there with no rhyme or reason doesn’t help to make your case. In fact, it substantially weakens it and makes you appear to be just another angry critic of the Mormon faith. There are enough of those out there. I’m not sure where you’re going with the King Follet discourse. I don’t see the conflict. Either I’m missing your point or you have a much different understanding about what is being said than I do. I am not angry Jay, I just know that Joseph Smith was no prophet of the one true God. Do your research as your leaders suggest. Joseph Fielding Smith: “Mormonism, as it is called, must stand or fall on the story of Joseph Smith. He was either a prophet of God, divinely called, properly appointed and commissioned, or he was one of the biggest frauds this world has ever seen. There is no middle ground.” Doctrines of Salvation, Page 188. Here is a great website that offers an objective study of the problems facing the Mormon faith. The Temple Endowment ceremony is simply a modified version of the Freemasonry ceremony which existed long before Joseph Smith was born. Joseph and Hyrum Smith were both active Masons. Many parts of the Temple Endowment Ceremony (verbiage, handgrips, arm positions, whispering in ear, fig-leaf apron, secret passwords, chanting, etc.) were plagiarized from Freemasonry ceremonies. Joseph Smith introduced the Mormon Temple ceremony within 2 months of becoming a Mason. There were Masons in the mob that killed Joseph as he had his arms raised in the Masonic distress call, “Oh Lord, my God! Is there no help for the poor widow’s son?” when he was shot. They had a problem with him plagiarizing the Masonic ceremony in the Mormon Temple ceremony. Please note that neither the Freemasonry ceremony nor the Mormon Temple Endowment Ceremony are secret, as all details of both are in the public domain. Veneration of the Leader: Excessive glorification to the point of virtual sainthood or divinity. Inerrancy of the Leader: Belief that he or she cannot be wrong. Omniscience of the Leader: Acceptance of beliefs and pronouncements on virtually all subjects, from the philosophical to the trivial. Persuasive Techniques: Methods used to recruit new followers and reinforce current beliefs. Hidden Agendas: Potential recruits and the public are not given a full disclosure of the true nature of the group’s beliefs and plans. Deceit: Recruits and followers are not told everything about the leader and the group’s inner circle, particularly flaws or potentially embarrassing events or circumstances. Financial and/or Sexual Exploitation: Recruits and followers are persuaded to invest in the group, and the leader may develop sexual relations with one or more of the followers. Absolute Truth: Belief that the leader and/or group has a method of discovering final knowledge on any number of subjects. Absolute Morality: Belief that the leader and/or the group have developed a system of right and wrong thought and action applicable to members and nonmembers alike. Those who strictly follow the moral code may become and remain members, those who do not are dismissed or punished. 1) Have all of his prophecies come true? 2) Has even one of his prophecies revised to fit what already happened? 3) Does even one of his teachings utilize a small section of the Bible to the neglect of the whole? 4) Does even one of his teachings contradict the God of the Bible? 5) Does even one of his teachings contradict the Jesus of the Bible? 6) Is he or is Christ the focus of his followers? Whose name is heard more often? 7) Do any of his teachings speak negatively about other Christians? Joseph Smith failed on all 7. On Feb. 14, 1835 Joseph Smith said, “… go forth to prune the vineyard for the last time, or the coming of the lord, which was nigh even fifty-six years should wind up the scene” (History of the Church, Vol. 2, p. 182). “On the 14th of Feb. 1835, Joseph Smith said that God had revealed to him that the coming of Christ would be within 56 years, which added to 1835 shows that before 1891 and the 14th of Feb. the Savior of the world would make his appearance again upon the earth and the winding up scene take place” (Journal of Oliver Boardman Huntington, Vol. 2, pp. 128,129). “And thus prophesied Joseph, saying: Behold, that seer will the Lord bless; and they that seek to destroy him shall be confounded…” (2 Nephi 3:14). Joseph Smith’s enemies were not confounded, but successful when they killed Joseph Smith on June 27, 1844 in Carthage, Illinois. 19I will personally deal with anyone who will not listen to the messages the prophet proclaims on my behalf. 20But any prophet who claims to give a message from another god or who falsely claims to speak for me must die.’ 21You may wonder, ‘How will we know whether the prophecy is from the LORD or not?’ 22If the prophet predicts something in the LORD’s name and it does not happen, the LORD did not give the message. That prophet has spoken on his own and need not be feared. There are teachings of Mormonism which separate it forever from Christianity and the Holy Bible. That God the Father has a body of flesh and bones and was once a sinful man on another planet. That God lives with many goddess wives on a planet near the great star Kolob. That Polygamy is part of God’s holy ordinances. That Jesus Christ is the brother of Lucifer, the Devil. Jesus had to work out his own salvation. That the doctrines of their inspired leaders are superior to the Bible. That men can become gods themselves by joining the Mormon church and will be able to create and populate their own earths. That the shed blood of Christ is not sufficient to save us from our sins, that it only gives us resurrection so we may be judged for our works; that men cannot be saved by grace through faith, but only by our works of righteousness. That the Mormon Church is the only true church on earth, to the exclusion of all others. It has the only true authority. That there are two churches only, The church of the Lamb [Mormonism] and the church of the Devil [the rest of us]. That man cannot gain eternal life and enter the presence of the Lord outside of Mormonism. The Book of Mormon is based on the concept that Meso-America was an uninhabited land that was peopled by Jews who floated across the ocean in an a boat of sorts that resembled two large dishes fastened together to form a hollow [with holes in both the bottom and the top for air]. In “Losing a Lost Tribe: Native Americans, DNA, and the Mormon Church” (Signature Books), research scientist and former Mormon Bishop, Simon G. Southerton of Canberra, Australia, peels back the faith promoting fantasies about these pilgrims in a dish and their loathsome offspring, the Lamanites, dark-skinned American Indians. Along with other research studies, (see: DNA Evidence and the Book of Mormon) the author puts a final nail in the coffin of the Book of Mormon myth. As the Mormon church was claiming at one point that the Book of Mormon was used by the National Geographic Society in order to locate ancient archaeological sites, Mr. Larson felt the need to write to the National Geographic Society for confirmation. This was their response. The Society has never used the Book of Mormon to locate archaeological sites, and we do not believe that any of the places named in the Book of Mormon can be placed geographically by the evidence of archaeology. So far as we know there is no archaeological evidence to verify the history of early peoples of the Western Hemisphere as presented in the Book of Mormon. If the National Geographic Society can find no archaeological evidence to support the book of Mormon – there simply isn’t any. How did Joseph Smith translate the supposed ancient record he found in the hill? State of New York v. Joseph Smith. that one Joseph Smith of Bainbridge was a disorderly person and an impostor. declined having anything to do with this business. palpable that witness went off disgusted. McMaster sworn: says he went with Arad Stowel, and likewise came away disgusted. dark colored stone, as he said that it hurt his eyes. oath, 25 1/2c. Seven witnesses, 87 1/2c. Recognisances [sic], 25c. Mittimus, 19c. Recognisances [sic] of witnesses, 75c. Subpoena, 18c. – $2.68. I am sorry book of Mormon believers but your church is not the one true Church that Jesus established some 2000 years ago. My prayers are with all of you. Please note that neither the Freemasonry ceremony nor the Mormon Temple Endowment Ceremony are secret, as all details of both are in the public domain. They were particularly famous for visionary projects, spent much of their time in diggings for money which they pretended was hid in the earth; and to this day, large excavations may be seen in the earth, not far from their residence, where they used to spend their time in digging for hidden treasures. Many of the people in Palmyra, including the ones criticizing the Smiths’, participated in treasure seeking. This isn’t a secret. It’s a bit hypocritical to say someone is “destitute of moral character” when you are just as involved in the occult. Let’s be honest. Also the quote was not collected by an impartial person Howe had an axe to grind with the Church. I’m sure he didn’t include anyone that spoke favorably of the Smith family. I’d be a lot more impressed if the “witnesses” had written it on their own. I don’t think any Mormon would say Joseph was Inerrant. This is a red herring. Sadly, this is true of many LDS members. Most do not separate their Prophet’s opinion from pronouncements as God’s mouthpiece. Not sure what your trying to say here. What do you mean by persuasive techniques? I assume you know of some that Mormons use that are unique from other Christian sects/denominations. Agreed. This is something the LDS Church needs to improve on and I believe they are doing it…glacially but they are doing it. Not really a true test. A prophet is not alway right or inerrant as you so correctly pointed out earlier. I think this is not a very objective question. It is subject to opinion based on the belief of the person asking. So I’d throw it out. I guess this would be a good one if you believe the Bible is perfect and doesn’t contradict itself. Otherwise, this question needs to go too. Again a very subjective question. Christ is the center of everything in the Mormon Church. Members are taught that its sole purpose is to bring souls to Christ. This last one was a little funny to me personally because I have attended several other Christian denominations and not one of them refrained from making some cutting remark about the LDS faith or others they thought “unchristian” (understand these were just random visits). In contrast, in LDS meetings it is an extremely rare occurance. Usually when it does occur it is a recent convert that has bad feelings about their former faith. As in the Bible, 18th century Mormons (Joseph included) thought the second coming would occur soon. It’s not surprising he was wrong since only God knows when it will happen. I don’t see this as proof that he was a false prophet, but more as proof that not everything he said was inspired of God. Second hand information from single non comtemporaneous source. If there were other sources to back this statement up you might have something, but there is none that I’m aware of. I put this in the same category as Zebedee Coltrin’s comment that Joseph Smith said blacks couldn’t hold the priesthood. This despite the fact that no record of such remarks is available not to mention years earlier Zebedee himself had ordained Elijah Abel a Seventy. Obviously, Joseph had never said what he claimed. David Patten expressed the desire to die for the Church as a martyr despite Joseph’s statement. People have free will and God isn’t going to force them to fulfill prophesies (If you believe that is what this was). If you believe the BOM was inspired this was a statement made by Joseph in Egypt not Joseph of New York, so it is a stretch to say it is a prophesy of Joseph Smith’s. This verse has been used ad nauseum to prove that a prophet has to be infallible. One wrong “prophesy” and he is a false prophet. The problem is that’s not what it’s saying at all (only Christ was perfect in word and deed). It’s saying that when a prophet speaks there are times when he speaks for God and times when he doesn’t. Not everything he says is from God. I agree with parts of your statement. However, Mormonism doesn’t claim to be like other Christian Churches. In fact, they wants to be different and preach that it is. As for it being separate from the Bible, I believe that’s how you view it but that’s not reality. The Bible continues to be interpreted to fit the mode of belief of those that read it. It is very plastic unless read literally. For those that choose to read it literally they run into other problems with contradictions. I’ve found that most Christians (LDS being no exception) take parts of the Bible literally and parts figuratively where it suits their theology. That’s the plain truth of it. I noticed you said teachings and not doctrine I would agree with this word choice. Just because someone teaches something doesn’t make it doctrine. I look at doctrine as being something members of a particular faith are required to believe. Many of the things you listed as “teachings” are not required beliefs and some haven’t been taught for over a hundred years. This statement is a very simplistic statement and is simply not true. Nothing in the Book of Mormon precludes the Americas being inhabited by other people (i.e. nomads from Asia). It is interesting how some Christians that deny the process of evolution are so quick to believe any DNA evidence that seems to disprove the BOM. I’ve never quite been able to understand how they accept one and not the other. As encouraging as it is that they have taken an interest in modern scientific studies, it is disappointing that these same critics ignore ecological theory and well known mechanisms of population dynamics to the point of accepting DNA evidence against the BOM without question. This unquestioning acceptance reveals their true bias. Unfortunately, CSI watchers think that DNA is always a slam dunk, but objective scientists know that this is not always the case. Doubtful, there is still room for a believer despite the “evidences” against the BOM. Admittedly, the evidence critics present is compelling but it does not “put a nail in the coffin of the BOM myth”. Who is Mr. Larson and when did the Church make this claim (I’ve never heard it.) In fact I’ve heard the opposite from LDS sources. They continually refuse to give a geographic location to any of the events in the BOM, stating that they just don’t know. I think National Geographic would be foolish to try to use such a vague reference as the BOM for scientific purposes. If the Church did make such a claim please show the article, proclamation or so on that states such, otherwise what you are doing is gossiping. If you want to say that a member of the LDS faith said this, I could believe that but to say it was the Church is fallacious. That is a very bold statement to make. The absence of evidence doesn’t prove anything. If it did then we could conclude there is no God because we can’t see, hear, touch, taste or smell Him. Weird huh? I believe it was Elder Nelson that talked about this in an Ensign article. True it is different than the method that has been portrayed by the Church over the years but how is a stone in a hat any more magical than say, someone rising from the dead, healing the blind with spit, changing water to wine, etc. etc. An honest person would say it is just as magical. Thank you for your prayers like all Christians we need them. Jay why do you defend falsehood? Joseph Smith Jr, is a prophet, though a false one indeed. You even mock Jesus in regards to how He performed His miracles. But this is understandable seeing how brainwashed you have become believing something that is not true. Truly unbelievable how you defend such falsehood. Mormonism is as pagan a cult as can be because it is nothing more than a copy of freemasonary, both of which are ushering in anti-Christ. Mormons are not Christians for you belief in a totally fictional Jesus. Because you are so proud and arrogant believing in Satan’s lie that one day you too can become a God only a miracle of grace would make you realize the gross error in reasoning you commit with every subjective response you make. The evidence is all there and you won’t find it at one of your cult meetings. “And it came to pass”…. over and over and over again. Infant baptism wasn’t even practiced at the time it was mentioned in the book of Mormon. Yet Joseph Smith goofs up and calls such practice was an abomination? Joseph are you a Christian? I not sure how you think I was mocking Christ. I was stating that Joseph Smith “translating” with the use of a stone is not any more “magical” than what Christ did? If it isn’t magical raising from the dead and turning water into wine what is it? How about when Moses struck the rock and water came out? Miracles are magical. But this is understandable seeing how brainwashed you have become believing something that is not true. I don’t think you fully understand me. It appears you read what I wrote as a defense of the LDS Church when it reality I just don’t like to see people so blinded by their own prejudice that they aren’t consistent in their arguments (a classic flaw of LDS critics especially the ones that only repeat what they have heard). I don’t view myself anymore brainwashed than your self. You view your theology as totally rational because that is the way you have been taught to believe. In reality we are all irrational because we want to believe we are right and will do whatever it takes to prove others wrong. That is to say the well indoctrinated (a.k.a. brainwashed) will do whatever it takes. Mormons are not Christians for you belief in a totally fictional Jesus. I’m almost ready to stop even responding to this argument because it gets tiring trying to explain to non-LDS Christians why such an argument is silly. Mormons are Christians, I grant you they are not orthodox Christians (as you would see it) but they are Christians like it or not. They have no desire to be associated with other Christian denominations, but they have a strong desire to be associated with the Christ of the New Testament and thus identify themselves (as do most non-LDS) as Christian. Because you are so proud and arrogant believing in Satan’s lie that one day you too can become a God only a miracle of grace would make you realize the gross error in reasoning you commit with every subjective response you make. I’m not attempting to be philistine. I guess I’ll just say that they Bible supports the idea of men becoming gods. You may not like that but I can’t rewrite the Bible for you. The evidence is all there and you won’t find it at one of your cult meetings. Your inflammatory language (i.e. Cult = Mormonism) does not induce me to take your arguments seriously. That coupled with the fact that I am well aware of the “evidence” you have presented and am far from convinced that it proves Mormonism is wrong. It is interesting and, dare I say it again, compelling, but it does not close the door for those that still want to have a rational belief. Rather the afore mentioned “facts” tend to ignore numerous other facts that would render your argument void or at the very least neutralize it. Jay, I’m not arguing with you because you don’t have a shred of evidence to prove that the book of Mormon is true much less the Word of God. The Mormon temples even have inverted pentagrams on them. On page 107 you can see for yourself that the Mormon temples have Satanic symbols all over them. Yet not one single cross, the symbol of God’s salvation for humanity. original physical form, written by the finger of God Himself! 3. If the original 1830 Book of Mormon was inspired than why were there so many errors and changes and additions and deletions, when compared to current editions? 4. How can we be assured that the translation of the B of M into French or any other language is correct? Only the English translation is claimed to be inspired! 6. Mormon Article of Faith #8: “We Believe the Bible to be the word of God as far as it is translated correctly; we also believe the Book of Mormon to be the word of God.” Why do you only add the phrase, “as far as it is translated correctly” to describe the Bible and not after the book of Mormon when in fact there are far more translating errors in the Book of Mormon than the Bible? forbidding the eating of meat except in winter, cold or famine? (Doc. & Cov. 11. When Christ died, did darkness cover the land for three days or for three hours? (Luke 23:44 and 3 Nephi 8:19, 23). 14. Why did the Nauvoo House not stand forever and ever? (Doc. & Cov. 124:56-60). 15. How can a man who is not a descendant of Aaron hold the Aaronic Priesthood? 16. Since Mormonism teaches that only God the Father had a physical body at the time Adam was created, why did God say, “Let us make man in OUR image”? Why didn’t He say, “Let us make man in MY image?” (Gen. 1:26). 17. If Jesus was conceived as a result of a physical union between God and Mary, how was Jesus born of a virgin? (Journal of Discourses, Vol. 1, page 50). 18. How did Nephi with a few men on a new continent build a temple like Solomon’s while Solomon needed 163,300 workmen and seven years to build his temple? (1 Kings 5:13-18 and 2 Nephi 5:15-17). 19. Why was Joseph Smith still preaching against polygamy in October 1843 after he got his revelation in July 1843 commanding the practice of polygamy? (Doc. & Cov. 132; and History of the Church Vol. 6, page 46, or Teachings of the Prophet, page 324). 20. God rejected the fig leaf aprons which Adam and Eve made (Gen. 3:21). Why do Mormons memorialize the fall by using fig leaf aprons in the secret temple ceremonies? 21. How do you explain the fact that 2 Nephi 16:2 is copied from an older version of the KJV of the Bible in Isa 6:2? This is proven because this older KJV (the mistake is corrected in current versions) made a rare grammatical error by using the incorrect plural form of “seraphims” rather than “seraphim”. 1. Why was Joseph Smith arrested for “money digging” and convicted of being a disorderly person? He admitted to being a money digger, though he said it was never very profitable for him (History of the Church, V. 3, p. 29). He and his father’s money digging continued until at least 1826. On March 20th, 1826, Joseph was arrested, brought before a judge, and charged with being a “glasslooker” and a disorderly person. The laws at that time had what was known as the “Vagrant Act.” It defined a disorderly person as one who pretended to have skill in the areas of palmistry, telling fortunes or discovering where lost goods might be found. According to court records Justice Neely determined that Joseph was guilty, though no penalty was administered, quite possibly because this was a first offense (Inventing Mormonism, Marquardt and Walters, SLC: Signature Books, 1994, pp.74-75). 2. Why did Joseph Smith have to use a seer stone both before and after being called as a prophet? stone placed in a black top hat? D. Michael Quinn writes: “During this period from 1827 to 1830, Joseph Smith abandoned the company of his former moneydigging associates, but continued to use for religious purposes the brown seer stone he had previously employed in the treasure quest. His most intensive and productive use of the seer stone was in the translation of the Book of Mormon. But he also dictated several revelations to his associates through the stone” (Early Mormonism and the Magic World View, D. Michael Quinn, Signature Books, SLC, 1987, p. 143). Richard S. Van Wagoner writes: “This stone, still retained by the First Presidency of the LDS Church, was the vehicle through which the golden plates were discovered and the medium through which their interpretation came” (Sidney Rigdon: A Portrait of Religious Excess, Signature Books, SLC, 1994, p.57). 4. Why would a prophet need to send members to seek for treasure seen in a vision? See D&C 111. Why wasn’t any found when the revelation states they would? 5. Did the Jaredites magic stones have anything to do with Joseph’s acquaintance with magic stones? 6. Why does the Book of Mormon discuss “slippery treasure” so much? By mentioning the 5 pointed stars and claiming them to be pentagrams (in the satanic sense) you show how overly eager you truly are to attack the LDS faith. Critics forget to mention that there are also Suns and Moons (oooOOOOOOOooo) carved into the temple walls. What you call pentagrams are five pointed stars going along with the theme of heavenly bodies. It is not some secret message from the occult. If it are secret why are they were everyone can see them on the outside of temples. As for the cross being displayed. I am much more interested in the words of Christ than I am in symbols. I can carry a cross with me everywhere I go or paste one onto the back of my car but it doesn’t make me Christian and it doesn’t mean I believe in Christ any more than another Christian. What really matters are actions not symbols. So the next time your child draws a star I hope its a four or six pointed one so he/she doesn’t get accused of worshiping Satan. Joseph, don’t you see how silly it is to be approaching Mormons this way? It doesn’t instill confidence in your message. I admire your desire to share Christ’s gospel but I can’t say that I agree with your method. Why not try having a respectful conversation? I rest my case against the church of Satan ~ soon an actual court case will be filed against the book of Mormon as the fraud needs to be exposed. Jay you just don’t get it. You are a true enemy of Christ as are all Mormons. Wierd because when I was in Rome last year so many of the early Christian sculptures had 5 pointed stars Moons and Suns but yet the Mormons are of Satan. Hmmmm! Joseph sounds like you would have been better suited to have been born in the 15th century then you could just burn “Jay” at the stake. Would that make you happy? The book of Mormon is fiction and Joseph Smith was a false prophet. Toward the end of the first century and the beginning of the second century A.D., the faith and love of Christians were really put to the test. Political and religious leaders throughout the Greco-Roman world felt threatened by this new religion, especially as it began to differentiate itself from its mother religion of Judaism. Followers of the ancient gods and goddesses, members of the upper class who wanted to maintain the status quo, and advocates of the divinity of the Roman Emperor saw dangerous implications in Christian teachings. Biblical books such as Hebrews and Revelation encouraged believers to hold onto their faith during these difficult times. In the early 100’s A.D., the Apostolic Fathers also provided guidance and courageous examples of faithfulness in periods of persecution. We use the name Apostolic Fathers for both books and authors, to indicate they include some of the “Founding Fathers” of the church and that their ideas are solidly anchored in the teachings of the apostles. Both Ignatius and Polycarp were bishops who died as martyrs for the Christian faith. Ignatius, Bishop of Antioch, was taken in a chain gang to die in the Coliseum in Rome. Along the way he met Christian leaders and wrote letters to the various churches. We’re fortunate to have Ignatius’ letters, because they give us good insights into early Christian thought and life. By using letters to churches as a way to communicate his beliefs, Ignatius was following the example of the apostle Paul. The account of the death of Ignatius’ fellow-bishop Polycarp marks the institution of the martyr cult. The word cult in this context doesn’t mean a fanatical sect, but a set of devotional practices. Throughout the Middle Ages, people venerated the clothing, bodies, and even parts of bodies of saints who had died courageously for their faith. Special worship services were celebrated annually on the day of their martyrdom. Polycarp was an old man when he had to decide whether or not to give up his faith. Christ had meant so much to him over the years that he wasn’t about to abandon Christ now — even if remaining true to him meant a horrible, painful death. Polycarp had been chosen by Roman officials as an example to warn others against Christianity because everybody in his home town knew him. Polycarp’s home town may make you think of the town in Tennessee where Nissans are built: Smyrna. One of the seven cities to which John wrote letters in his Revelation, Smyrna was in the area that we now call western Turkey. The Christians of Smyrna, rather than being devastated by what happened to their bishop, were inspired by the courage that Polycarp showed in facing death! The third of the Apostolic Fathers isn’t a “father” at all; it’s an anonymous writing called Didache (don’t pronounce this like a tooth which did ache, but did-uh-kay). The Greek word could be translated Teaching of the Twelve Apostles. It gives us insights into early Christian worship, administration, and organization. Thus we could compare the Didache to the kind of church manual used in United Methodist churches today. Hint: since the Didache claims to be close to the teaching of the apostles, think of a disciple as linked with the United Methodist manual of church organization and beliefs. Yes, the Book of Discipline! By the way, one of the Dead Sea Scrolls written by the Essenes in the first century B.C. is called by modern scholars the Manual of Discipline, because it too deals with basic organizational principles. The Didache helps us too understand early Christian understandings of baptism and the Lord’s Supper. The fourth of the Apostolic Fathers is an epistle known as 1 Clement. A later sermon attached to it is commonly called 2 Clement, but since it has an entirely different set of ideas and circumstances, we’ll not deal with this later writing. 1 Clement is an official letter from the church in Rome to the church in Corinth. It was written by the head of the Roman church. The epistle was so highly respected that some early collections of scripture included it in the New Testament. A basic theme in 1 Clement is the need for unity of Christians rather than divisiveness. Apparently the church in Corinth was still having many of the same problems that caused Paul to seek to unify the church many years earlier. Clement, the leader of the church in Rome, tried to establish some lines of authority to eliminate quarrels and rebellions. The term Pope had not yet come into use, but Clement functioned as the bishop of the Roman church. He suggested that the line of authority could be traced from him all the way back through previous Roman bishops to Simon Peter, the Rock on whom Christ built his church. We use the term apostolic succession to identify the principle of an unbroken chain of church leaders going back to the time of the apostles. Churches today which maintain apostolic succession usually have bishops who lay their hands on the heads of persons to ordain them as priests. Apostolic succession is especially important in the Catholic and Episcopal churches. The book of Mormon’s author was Joseph Smith. The true Church that Jesus established 2000+ years ago never left the Earth. It has stood up against the gates of hell and will remain until Jesus returns to establish His Kingdon. Focus on the teachings of Christ and only Christ, not on the teachings of men. Satan has all Mormons in the palm of his hand and you are no threat to him. That’s why the book of Mormon “feels” true. The Book of Mormon doesn’t “feel” true to me. I think it holds a lot of good teachings that can help to make a person more Christ like. However, I’ve always found the New Testament to be more compelling. Christ’s words touch my heart. This doesn’t mean that I haven’t felt the same way while reading portions of the Book of Mormon, but personally I like the New Testament more. Become a true Christian and then the battle begins because Satan wants your soul seperated from God for all eternity. This is common statement made in one form or another by Mormons, Baptists, Catholics, etc. Their Church is true and Satan is so much harder on them. I think it reaffirms in each of their minds that they have the truth. Each persecution, each hardship is because Satan it fighting against them. What they tend to ignore is that other are going through the exact same thing they are and they are not of the same faith. If you have ever been Mormon you would know that they have struggles and “persecutions” that are just as real as any found in other Christian faiths. Satan hates good and will fight against it wherever it is found. soon an actual court case will be filed against the book of Mormon as the fraud needs to be exposed. Sounds great! When is this going to happen, or is that a secret? If anyone can prove the Book of Mormon is a fraud in the courts, that would truly be an accomplishment. Unfortunately, most of the evidence (all of it I know of) against the BOM is not strong enough to win a court case. I imagine such a case would just be thrown out of court. I appreciate the history you have shared and am interested in learning more about the early Christian Church. It is amazing some of the stories I have heard and the sacrifice early Christians went through. Very inspiring. Christ is the focus of what I believe. I am not an exactly an orthodox Mormon. I don’t believe any LDS prophet is infallible or hasn’t made mistakes. I don’t necessarily believe that the BOM is actual history, but do believe it contains some good teachings. I don’t believe I’m closer to God as a Mormon than you or any other Christian is. I don’t just follow whatever my leaders say, but think about if what they say squares with what I know about the scriptures. I am open to consider alternative interpretations of the Bible. However, my beliefs are my own and I don’t change them just because someone thinks I’m going to Hell. My primary concern is what God thinks and whether my heart is right before Him. Everything, everyone else is secondary. I know what I sincerely believe and what my conscience tells me and I know that God knows, that’s good enough for me. I don’t think anyone has it all figured out Mormon or non-Mormon. I reject the notion that just because someone is Mormon, Buddist, Baptist, Atheist, etc. that God will condemn them to endless torment. That is not a fair or just God in my opinion. God looks on the heart not the symbols on our houses of worship or a person’s religious affiliation. Evil is crushing the spirits of our brothers and sisters pretending to have dominion over them. Good is lifting them up, giving hope and making the world a better place. This is what Christ taught was important and I believe him. 1. Why did the angel take Nephi Plates back to heaven? Would gold plates really convince those that don’t want to believe. No they would not. Faith is about believing despite a lack of physical evidence not because of it. Do you believe Adam and Eve were real? An atheist would say show me the garden and then I’ll believe. It’s so simple right? Christ warned against this type of sign seeking precisely because it doesn’t help change someone’s heart. I’ve read the New Testament start to finish and most of the Old Testament (I find it rather boring to tell the truth). There are a few gems in the OT (historical and spiritual) but for the most part they are also found in the New Testament. I have prayed to God about the Bible and feel it is a true book. I do not have to ask God if it has been changed or is missing parts, the Bible testifies of that on its own. It is dishonest to view it as not flawed in any way and from my conversations with non-LDS Christians, I don’t think many of them truly believe that either. Everything comes through the filter of man, this doesn’t mean it was not originally inspired of God. You can’t. People just do their best. When I was a missionary in South America the Book of Mormon was looked at more closely and updated to give a more accurate translation from the original English version. Anytime you translate to a different language things are lost or misinterpreted. That’s just the way languages work, it doesn’t mean that the BOM is not inspired. 5. How do you account for the stunning parallels in both content and order between the B of M and the View of the Hebrews, by Ethan Smith? I am aware of the View of the Hebrews and the parallels between the two. Again it is very interesting and again I don’t necessarily believe that the BOM is a historical account of the Americas. I just think it is an amazing book that teaches good things. I might even go as far to say it was inspired of God. This is one of the reasons I do not consider myself an orthodox Mormon. Most LDS members believe whole heartedly that the BOM is a historical account of at least some of the Native Americans. I think there is room for rationally believing that, I just don’t subscribe to it. 6. Why do you only add the phrase, “as far as it is translated correctly” to describe the Bible and not after the book of Mormon when in fact there are far more translating errors in the Book of Mormon than the Bible? I’m not so sure that is a fair statement. The majority of the Changes to the book of Mormon have been to make it more readable (organizing into paragraphs, puctuation), not necessarily because it was wrong. With that said, I realize that there are few passages that have been significantly changed from the original. I’m also unsure about your facts here. That number from my own understanding includes punctuation, but I’m open to correction if you can give me a source that I can read. I’m not so sure they were actual gold plates. They had the appearance of Gold and could have been an alloy of some kind. I really don’t know and don’t find it an important question to ask. That doesn’t happen until after the second coming. So it’s a mute point. LOL. I’ve thought about this myself many times. Mormons should be the healthiest people on earth (and we are healthier on average), but we fail to live up to our own high standard all the time. Although I think refraining from alcohol along (something the overwhelming majority of LDS members do) justifies the value of the Word of Wisdom. 11. When Christ died, did darkness cover the land for three days or for three hours? (Luke 23:44 and 3 Nephi 8:19, 23). 3 Ne 8:19, 23 doesn’t claim that darkness was over the whole earth just over the land where they were or the Americas. The New Testament claims the darkness was over the whole earth for 3 hours, so they don’t contradict each other. Already addressed this one in an early comment of yours. There is no real proof that Joseph actually said this. Tell us what the 14th was? I’m interested. I don’t think that is what these verses are saying. Not sure what your getting at, please elaborate. Mormonism teaches that Jesus had a spiritual body in the form of a man, thus they created Adam in their image. The fact that you ask this question shows how little you understand Mormonism. You will be hard pressed to find someone that actually teaches that other than Brigham Young over 150 years ago. Most LDS members don’t even believe that, I know I don’t. I’m really not shocked by anything Brigham Young said because is was known for making outrageous statements. 16 And I, Nephi, did build a btemple; and I did construct it after the manner of the temple of Solomon save it were not built of so many precious things; for they were not to be found upon the land, wherefore, it could not be built like unto Solomon’s temple. But the manner of the construction was like unto the temple of Solomon; and the workmanship thereof was exceedingly fine. “like unto” and was are two very different things. I take this as meaning it was similar to Solomon’s temple, but was not an exact duplicate. This could very well mean it was smaller than Solomon’s temple. The apologist answer would be that he was afraid of being killed. I realize this is a satisfactory answer only for a believer of Mormonism. However, it is a logical explanation. To be honest the way Joseph Smith and others practiced polygamy is troubling to me. This is really petty and I don’t think God really cares. I’m not sure what you mean by “God rejected the fig leaf aprons which Adam and Eve made” and I don’t see anywhere in the verse you site where it says that. Do you want me to say Joseph copied from the KJ Bible? Maybe he did, it doesn’t really matter to me or change my opinion of the BOM. I understand Michaelus’s/Joseph’s Zeal as he/they sincerely believes Mormons are Lost and Duped by Joseph Smith and are continually being misled. Howver I can equally understand why the run of the mill TBM Mormons think the other denominations are missing a few vital truths supposedly restored by Joseph Smith. I’m not sure what the answer is myself except I think a free and frank discussion is helping address the balance of information which ultimately influences and shapes what we believe and even can know factually. I remember as a youth in my ‘JW’ Zeal , someone telling me that If I had been born in Palestine then I would most likely be a Muslim and sharing that with equal enthusiasm and conviction and possibly even throwing rocks at Israeli Tanks ! It made me think that day and it has haunted me until this very day. Since all the Christian denominations and Islamic groups accept Jesus Christ in one form and another , I think its safe to say , we will have a real truth restoration if it is in fact needed ( assuming the original catholic church has got it wrong also )when he ‘returns’ unless Buddha turns up first ! Lets endevour to do good as Jesus taught . At least thats one aspect of my own personal Mormon Church experience that I have taken on board. 15. It is a fact that in order to hold the Aaronic priesthood, you have to be a descendent of Aaron. This is why John the Baptist held the Aaronic priesthood, but Jesus did not. 17. This is actually taught in the book “Jesus the Christ” by Talmage. Jay, lol! Man you rationalize and justify falsehood to a degree that only the father of all lies would be proud of. You would make a great politician for you have “plausible deniablitiy” down pat. The One True Church has suffered much as Jesus said it would. Yes it has allowed some very evil men to influence it as there have been several really corrupt popes. Yet during those times it has produced some of the greatest real Saints the world has ever known. Some of which have been call The Incorruptibles, because their bodies have yet to corrupt and The Odor of Sanctity surrounds their bodies. Over 2000 years of Church teachings, doctrines, traditions, visions and revelations are available to anyone who wishes to embrace the Sacred Heart of Jesus, His Mother, His Father and all who have called themselves, not believers, but lovers of God. We are on track and you started this forum or chat. Don’t be afraid to embrace the Cross, for without it there is no salvation. I feel sorry for all Mormons because you believe whatever “feels” acceptable and this is not revealing as to the true nature of the One True Church. For the One True Church posseses four traits. It is United, Apostolic, Holy, and Universal. The first time the world “catholic” was used was around 110 AD when Ingnatius of Antioch was asked this question, “What do you believe about the Christ?” Ignatius replied “Katholikos!” Greek (from katholou) word meaning “throughout the whole,” “universal,” or “general.” It was used by early Christians to describe their faith, in that Jesus was the intended savior of all mankind. Katholikos is where we get the word “Catholic”. I must concur with Joseph as he is on target. The rest of you are suffering from the treasonous spiritual influences of your political affiliations in a most worldly sense. And elderjoseph I doubt very seriously if you truly understand my Zeal as you call it. Whoever teaches must become “all things to all men” (1 Cor 9:22), to win everyone to Christ. . . . Above all, teachers must not imagine that a single kind of soul has been entrusted to them, and that consequently it is lawful to teach and form equally all the faithful in true piety with one and the same method! Let them realize that some are in Christ as newborn babes, others as adolescents, and still others as adults in full command of their powers. . . Those who are called to the ministry of teaching must suit their words to the maturity and understanding of their hearers, as they hand on the teaching of the mysteries of faith and the rules of moral conduct. This teaching is conceived as an organic presentation of the universal faith in its entirety. The whole concern of doctrine and its teaching must be directed to the love that never ends. Whether something is proposed for belief, for hope or for action, the love of our Lord must always be made accessible, so that anyone can see that all the works of perfect Christian virtue spring from love and have no other objective than to arrive at love. If you do not understand, then please in the Holy Name of all that is good, do not judge what you obviously do not understand. I am not referring that you are stupid, just ignorant. It is completely forgivable once you understand. I am not afraid to die and understand what I am to do as Christ lives within me. The love of Christ lives within each and everyone to the extent of one’s piety, devotion, and a rational and reasonable use of freewill to arrive at love and only love. Within the ancient teaching we arrive at a place where there is no deception. The remnant, or small surviving group that has been entrusted with the fire of burning love, for not only Christ and what He did for us, but for every human being whatever their level of understanding and knowledge are. Remember this especially when passing judgment, for when you pre-judge you cause the love of Christ for all to suffer. This happens when someone sets themselves up as judge or “prophet”, thus revealing how far from truly being “born again” in Christ they are, and how far they really are from being truly one in Christ themselves. Christ is Lord and King. And it will be governed with His elect. This Kingdom will emerge as a sprout from the remains of the great tree of Christianity, after lightening strikes it to the ground. The Remnant is alive and well. Fear not, teach only a burning love for Christ and His sorrowful passion as He gave His life for us to show the world how much God so dearly and mercifully loves the world. Teach love and fear not the anti-Christs and their disastrous attempts to rule as they will fail and fail miserably, but rather focus on the omnipotent love of Christ and His Kingdom that will vanquish all unloving spirits! It is said for those who truly believe in and love Jesus, no explanation is necessary. But for those who don’t, none will suffice. The original topic was about how people felt about the Pope’s statement that the Catholic Church was the one true church, so yes we have strayed from the topic. My offer still stands to correspond by email if you wish to continue, though I don’t really see the point. You’re so entrenched in your own dogma you don’t know when to admit your wrong. I don’t blame you though as its hard to admit it when you think you’ve got God figured out. I’m not sure what you mean by “plausible deniability”. I simply showed you why your examples hold little weight and I suppose your reaction (and lack of answers to the few questions I posed) is only a manifestation of your acknowledgment that it is so. I wish you no ill will and hope that you find peace worshiping Christ in your own way.